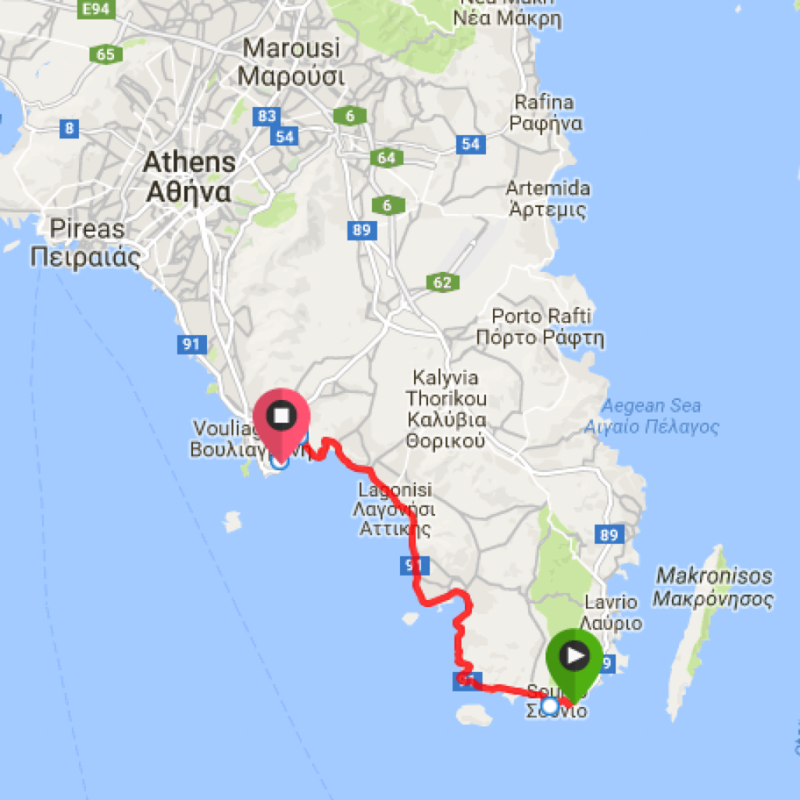 If you are looking to escape Athens for the day, we have a thrilling bike ride that puts you parallel with the sea on your right side as you head south to the tip of the Attika Peninsula. 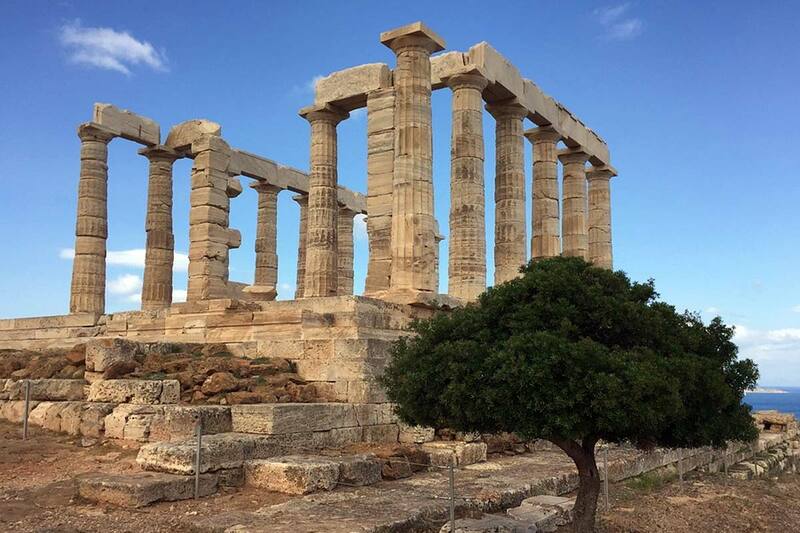 Cycle Greece seaside to the stupendous Temple of Poseidon in Cape Sounion.The Temple sits on a promontory overlooking the Aegean Sea with 360 degree views. Built in 440 BC, the mighty temple has mesmerized many with its magnificence, including the British poet Lord Byron who carved his signature in one of the marble columns circa 1810. 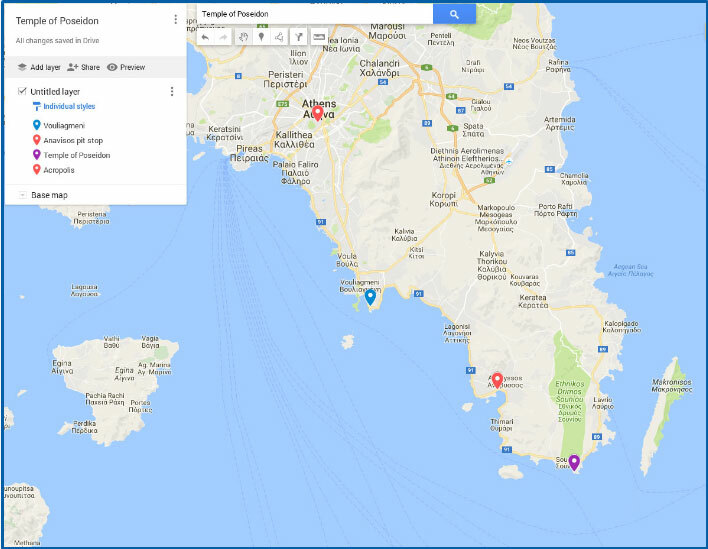 Strategically situated, Cape Sounion enabled Athenians to control the sea passage to Piraeus port, as well as Lavrio whose silver mines were responsible for Athens’ superpower status which was emerging in the 5th century BC. 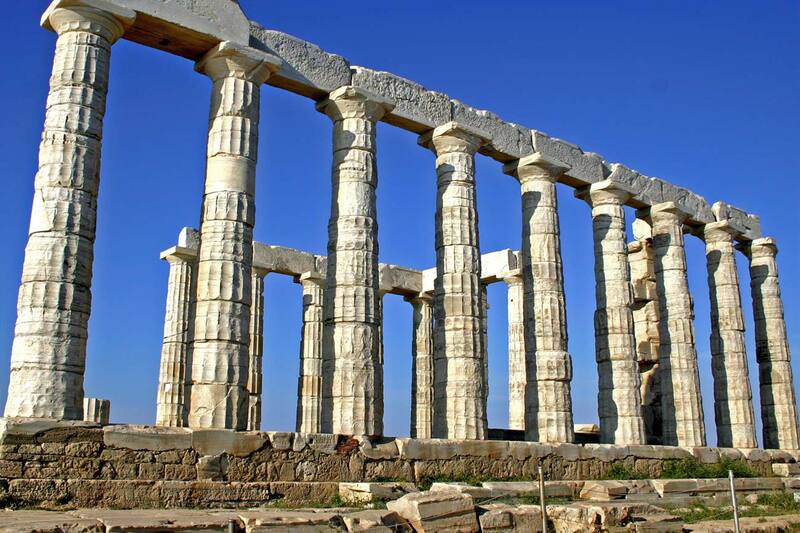 The Temple of Poseidon is a relatively small archaeology site. You could take one hour exploring every inch of its grounds. There’s a Temple of Athena across the road, but most folks just spend about 20-30 minutes admiring the panoramic view and the elegant marble columns. 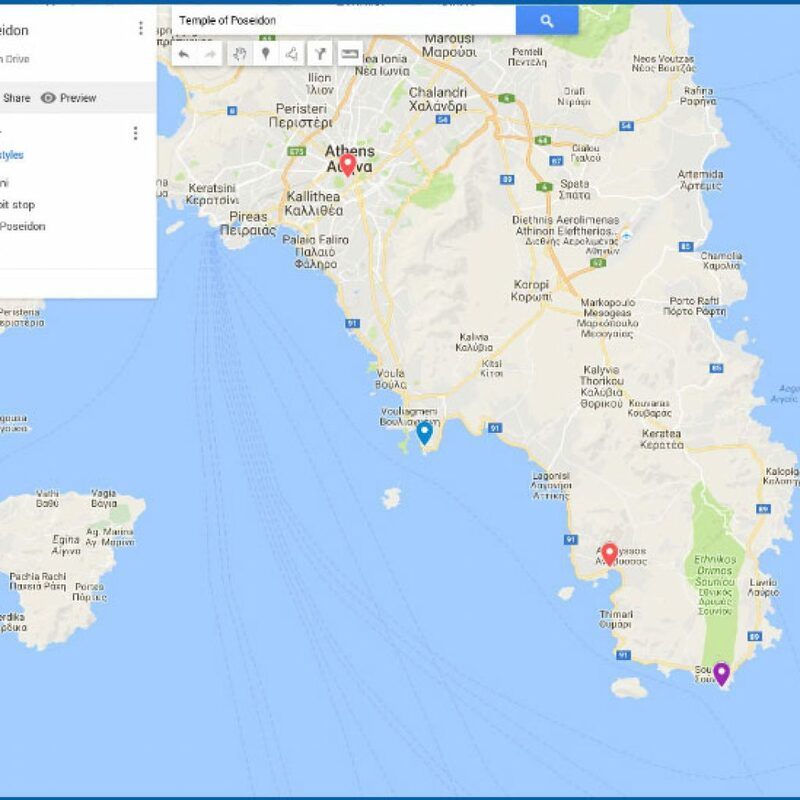 Option to cycle Temple to Temple – from Acropolis to Poseidon.Look for Lord Bryon’s graffiti carved in Temple of Poseidon’s marble column.Eat fresh fish in a fish taverna on the sea.Swim in the warm quiet tideless waters of the Aegean Sea.Behold the Athenian cyclists who regularly train on this coastal road. 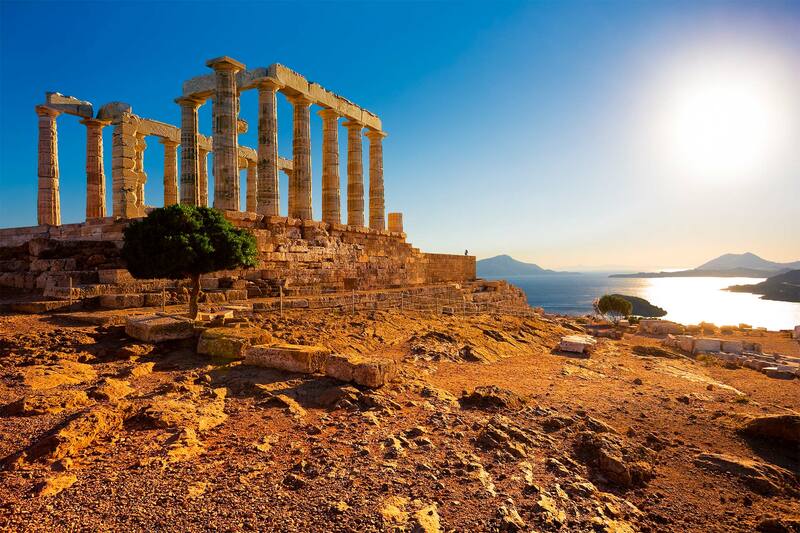 In Greek mythology Sounion is where King Aegeus threw himself into the sea when he saw black sails on his son Theseus’ ship. 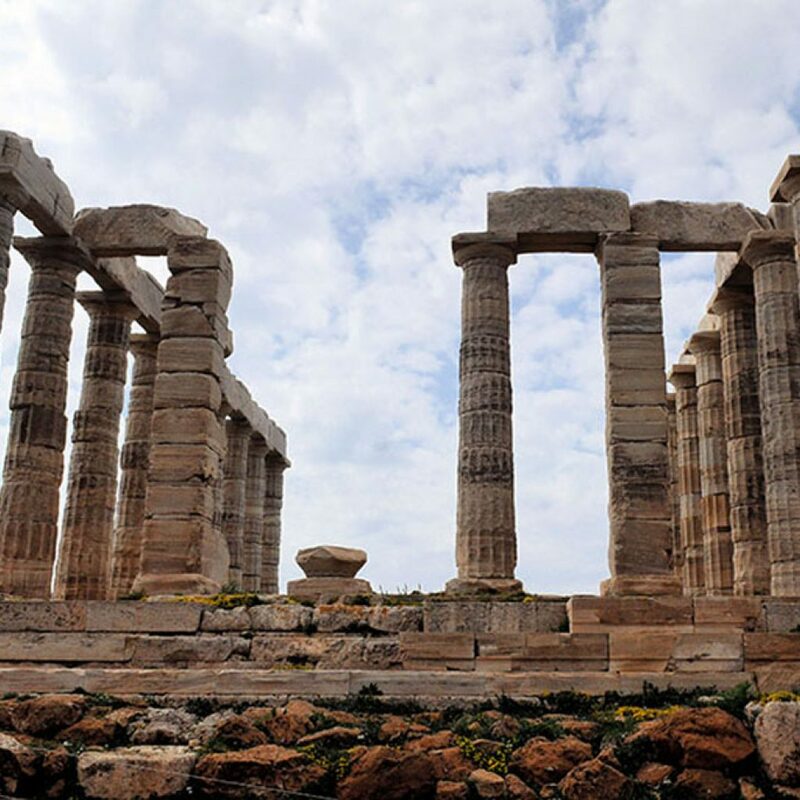 Theseus had agreed to raise a white sail to indicate he killed the Minotaur of Crete but he forgot and this caused the King to jump to his death from the promontory of Sounion. The Aegean Sea is named for him. For us cycling is a way of life woven into our daily reality. Greece has provided us with a glorious venue to commit ourselves to spreading the culture of cycling. 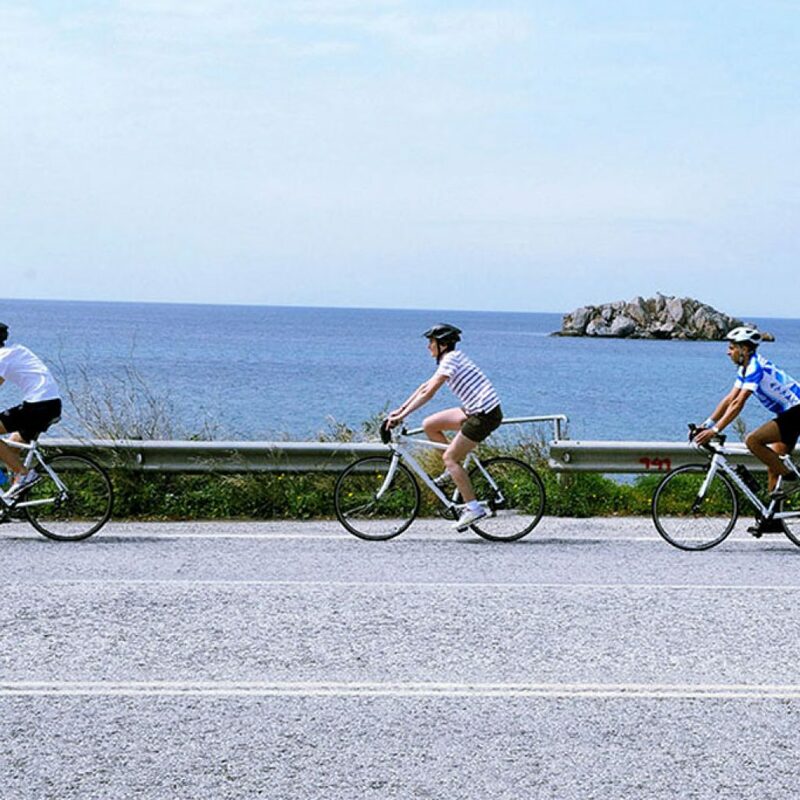 By combining our cycling expertise with our Greece expertise and sharing it with our guests, we reap rewards by witnessing their joy discovering Greece in slow motion. There’s a long version and a short version of the Temple of Poseidon ride. 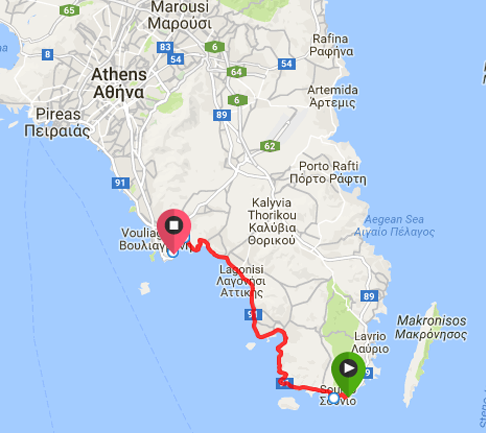 The long version is 70 km and starts at the Acropolis — ride from Temple to Temple! –and takes 3.50 hours when pedaling at 22 kph. The short version entails a 40 minute vehicle transfer to Vari. It is 35 km, taking 2 hours pedaling at 16 kph. Both versions stop at Anavisos for frappes, orange juice, bathrooms. 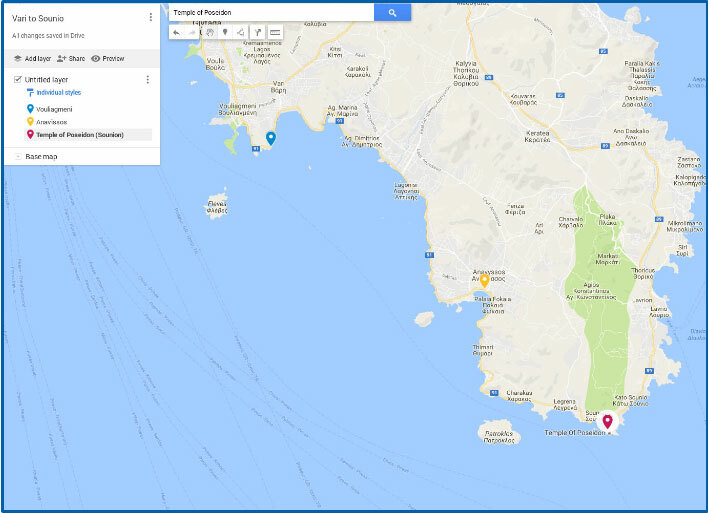 At 09:00, we pick you up either at your hotel in central Athens, or in PIraeus if you are on a cruise ship, and transfer in company vehicle to Vari, located about 40 minutes along the Poseidon Avenue. 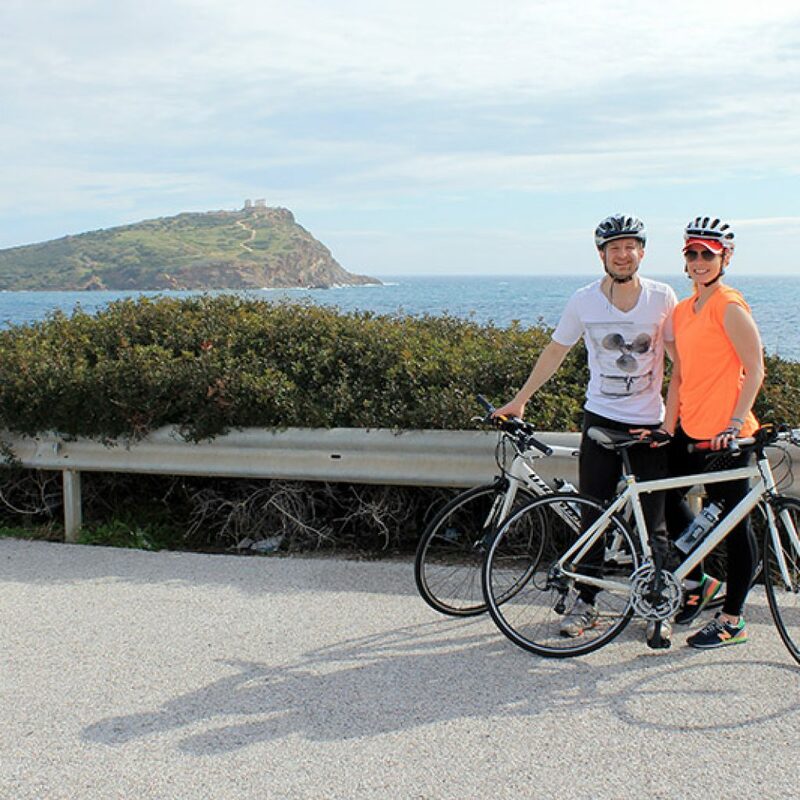 Vari is where you will start biking on the road that hugs the coastline all the way to Sounion where the Temple of Poseidon sits at the tip of the Attica peninsula. There is a pit stop about half way at Anavisos. 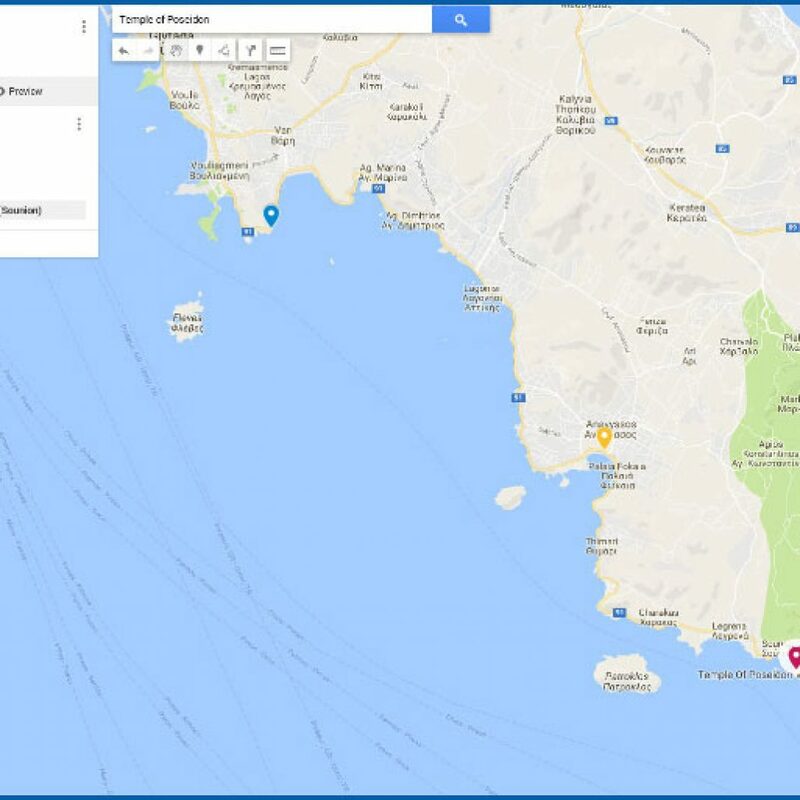 At 08:30, we pick you up from your central Athens hotel, or in Piraeus if you are on a cruise ship, and transfer you to the Acropolis from where you start the bike ride. You take the car-free walkway to the bike path and ride down to the sea, eventually reaching Flisvos Marina. Now you are on Poseidon Avenue and stay on it for about an hour to reach Vari. 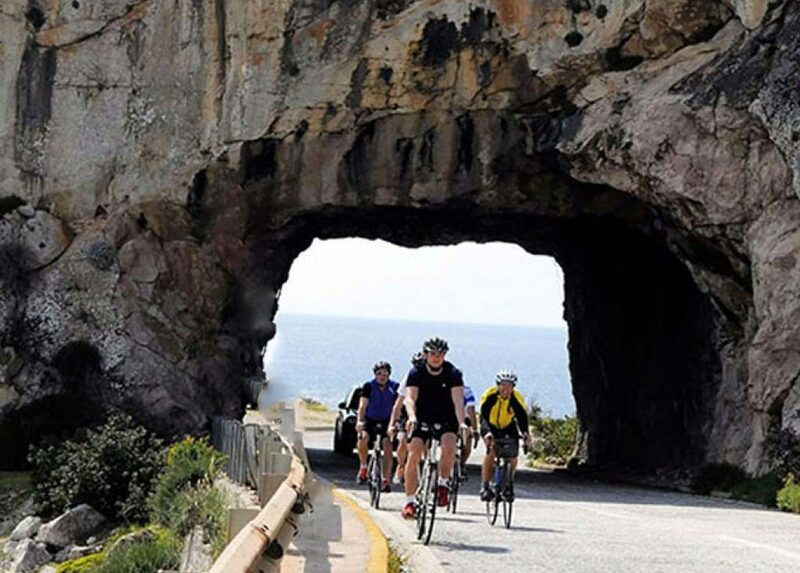 From Vari, it is about two hours of cycling to the the Temple of Poseidon. 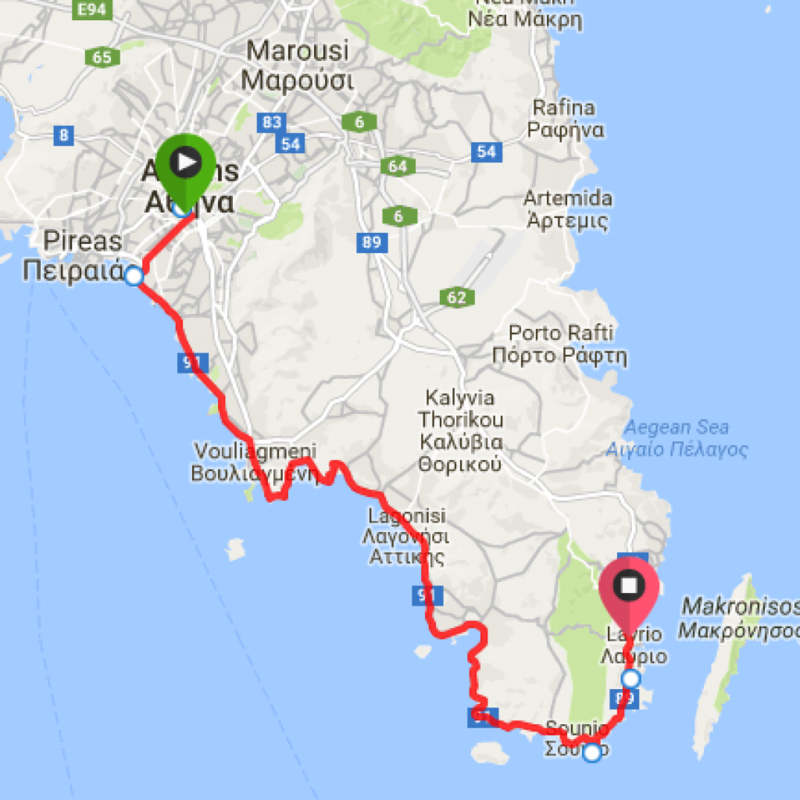 Acropolis to Vari — Apart from the descent to the sea, this stretch is mostly flat with some minor hills before Vari. This leg takes about one hour. After reaching the sea, option to ride on sidewalk to Gylfada or on the road with traffic. Vari to Anavisos town. — This part of the ride is flat mixed mixed with some baby hills, a little more traffic than the second half. This leg takes an hour. Anavisos pit stop — Get refreshed at an outdoor cafe with a cappuccino, smoothie, or fresh orange juice. 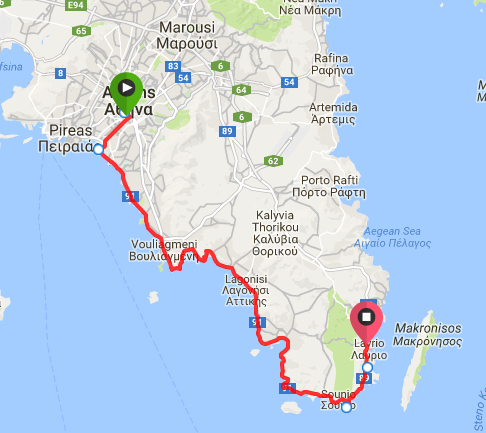 Anavisos to Sounion — Second half of the ride is shorter in miles but because it has 5-6 hills, it is a little harder. The highest hill is 328 feet, 100 meters. The beauty of this leg is that there is almost no traffic. Ride with the wind! The tour ends at the entry to the Temple of Poseidon site. Vehicle transfer to the taverna for a seafood lunch and swimming. Vehicle transfer back to your Athens hotel or your cruise ship in Piraeus. The return is usually by 17:00. Support vehicle: (“sag wagon”) with bilingual driver who is also a bike mechanic. Vehicle carries spare parts, spare fully pumped wheels, floor pump, ice cooler, water, nutritious snacks, bike tools, first aid kit, day packs, and gives you a lift if you get tired. Tour Leader / Bike Guide: the Tour Leader handles all the tour logistics and cycles with the group. For 2-3 riders, no bike guide, just cue sheets plus driver indicating the route. Bikes: Specialized road bike or hybrid bike. Triple chain ring, 27 gears. Road bike has carbon fiber fork. Hybrids have front suspension. E-bike available as an upgrade on request for 48 euros. Regular pedals or toe clips on request. You are welcome to bring your own clip-in pedals and shoes. Lunch: Seafood lunch at seaside taverna. Meat and vegetarian options as well. Transfers: From your hotel or cruise ship to bike start point and return transfer at end of day.